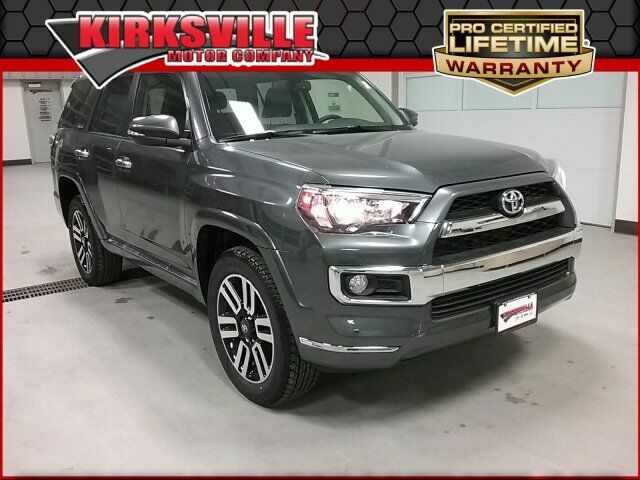 People can't stop talking about this popular 2019 Toyota 4Runner Limited. LIMITED PACKAGE, ALL-WEATHER FLOOR LINERS/CARGO TRAY PACKAGE , LEATHER-TRIMMED 50/50 SPLIT FOLD-FLAT 3RD ROW, KEEP IT WILD SAVINGS, EXHAUST TIP - CHROME, EXHAUST TIP, BALL MOUNT, Window Grid Diversity Antenna, Wheels: 20" x 7.5" Unique Dual 6-Spoke Alloy, Variable Intermittent Wipers w/Heated Wiper Park. Test drive this must-see, must-drive, must-own beauty today at Kirksville Motor Company, 3607 N Baltimore St, Kirksville, MO 63501.